Shiny Carvanha in game: 33 Who? Important notice! Pokemon Shiny Carvanha is a fictional character of humans. Carvanha (Japanese: キバニア Kibanha) is a dual-type Water/Dark Pokémon introduced in Generation III. It evolves into Sharpedo starting at level 30. 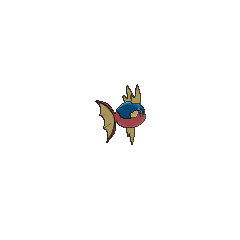 Carvanha is a fish Pokémon with a body covered in tiny, sharp denticles. 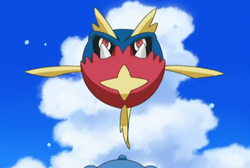 The top half of its spherical body is blue, while the bottom half is red with a yellow, four-pointed star below its mouth. It has two yellow dorsal fins above its eyes that resemble shark fins, and a matching pelvic fin on its belly. Its pectoral fins are also yellow. The caudal fin is composed of two red spines with a thin yellow membrane stretched between them. It has powerful jaws and razor sharp teeth that are able to chew through solid steel and rip up boat hulls. It swarms any intruder and prey that invade its territory, and becomes timid when it is alone. It lives in rivers that course through jungles. Carvanha first appeared in A Corphish Out of Water. When Ash had to take his sick Corphish to a Pokémon Center, he had to cross a river that was infested with Carvanha. 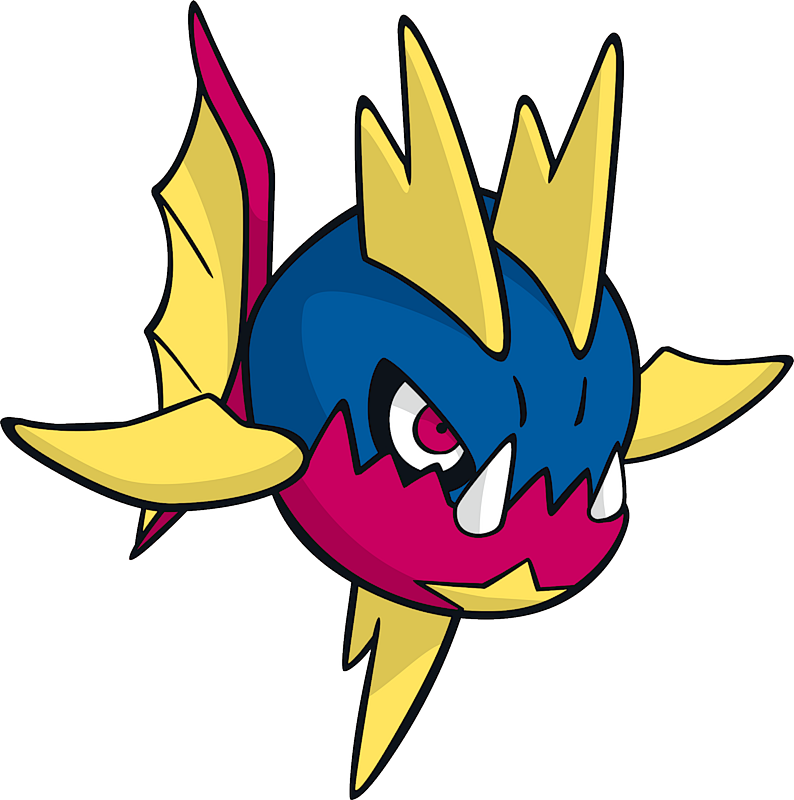 Over the series, Carvanha was one of the Pokémon used by Team Aqua. A Carvanha appeared in SM012. James tried to catch it, but failed. A Carvanha appeared in the opening of Destiny Deoxys. A Carvanha appeared in Up Close and Personable! Multiple Carvanha appeared in Diancie and the Cocoon of Destruction. 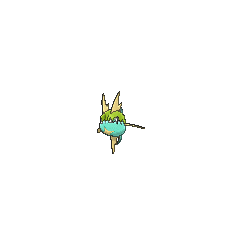 A Carvanha appeared in Alola to New Adventure!. Two Carvanha appeared in SM005, during a fantasy. AG024 Carvanha Ash's Pokédex Carvanha, the Savage Pokémon. Carvanha has powerful jaws and razor sharp teeth able to chew through solid steel. Carvanha will form packs and attack any invaders in its territory. A wild Carvanha appeared in the waters that surrounded the Seafloor Cavern in The Cavern. 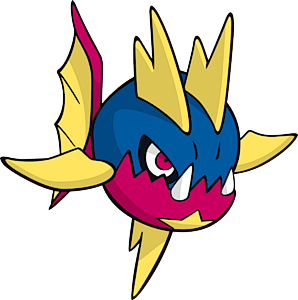 Carvanha was one of the Pokémon owned by Aqua Admin Amber. Amber used Carvanha's Rough Skin to wear down Sapphire's Torchic and Aron. It was later left behind at the Seafloor Cavern to cover for its Trainer as he made his escape. In the Omega Ruby & Alpha Sapphire chapter, a second Matt appears using a Carvanha at Mossdeep City to attack Sapphire to prevent her from stopping Zinnia's plan in PAORAS13. Carvanha attack ships in swarms, making them sink. Although it is said to be a very vicious Pokémon, it timidly flees as soon as it finds itself alone. It lives in massive rivers that course through jungles. It swarms prey that enter its territory. Carvanha’s strongly developed jaws and its sharply pointed fangs pack the destructive power to rip out boat hulls. Many boats have been attacked and sunk by this Pokémon. If anything invades Carvanha’s territory, it will swarm and tear at the intruder with its pointed fangs. On its own, however, this Pokémon turns suddenly timid. Each school has its own territory. Any intruders are mercilessly attacked with fangs bared. If they scent the faintest trace of blood, they rush to attack en masse. When alone, they're rather cowardly. Moves marked with a superscript game abbreviation can only be bred onto Carvanha in that game. 51%-100% HP I can munch down a cow. No problem! 26%-50% HP This is looking bad... My health is down by half. Level up Yes! Leveled up! I'm going on an eating spree! Carvanha chomps repeatedly with sharp fangs. Beware if they are in a pack. Carvanha are helping out with Gyarados's Aqua Dash in the Beach Zone. They wouldn't let Bidoof build any bridges. 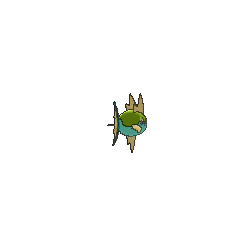 For other sprites and images, please see Carvanha images on the Bulbagarden Archives. 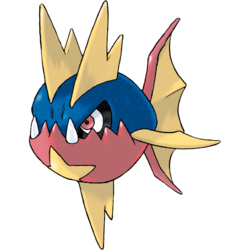 Carvanha is tied with Magikarp for having the lowest Special Defense stat of all Water-type Pokémon. It also has the lowest Special Defense stat of all Dark-type Pokémon. In addition, it is tied with five other Pokémon for having the lowest Special Defense stat of all Pokémon. Carvanha is mostly based on piranhas. Carvanha may be a combination of carve or carnivore and piranha. Kibanha may be a combination of 牙 kiba (fang) and piranha. Mandarin Chinese 利牙魚 / 利牙鱼 Lìyáyú'' Literally "Sharp-teethed fish"